What Are the Necessities for Having a Tarantula? A tarantula might seem like an easy pet to keep, but they're complex creatures that require careful attention. If you want to keep one of these spider species, you'll need to provide several necessities for your pet. 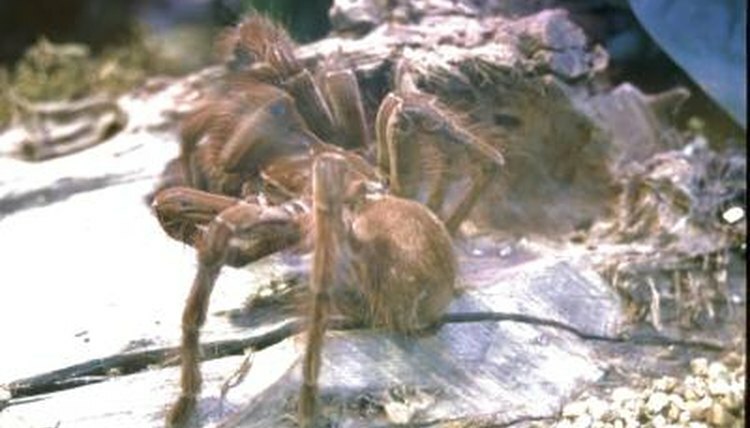 A ground-dwelling species is recommended for beginner tarantula keepers. When choosing a house for your new tarantula, make sure you don't go too big. In the wild, most tarantula species lay in wait for prey in their burrows and do very little moving around. A tank of around 12 inches wide and 6 inches deep will suffice, as any additional space is likely to go unused. You can get specialist spider vivariums, but an aquarium is fine, as long as you're careful to secure the lid. His tank will also need to contain 2 to 4 inches of peat or moss substrate, which you can buy from pet stores. Unless you live in a warm climate, and your home is consistently between 75 and 85 degrees Fahrenheit, you'll need to get a heater for your tarantula. As your pet also requires plenty of humidity, heating mats placed under the cage are better than lamp heaters, which will dry out his environment. When placing a mat heater, put it under only half of the tank. This way, if your tarantula gets too hot, he can regulate his own heat by going over to the cool side, or vice versa. The most important piece of furniture for your tarantula's new home is some sort of hiding place. These spiders are primarily nocturnal, so they'll spend most of the day hiding away. You can buy your pet a hidey-hole from most pet stores, but make sure you use one specifically designed for spiders, as other kinds could injure him. Any other adornments are unnecessary, but can be added to make the tank look more attractive. Silk plants are usually the best decoration, as they can't injure your spider and they don't need light like real plants. Before getting your tarantula, pick up some appropriate food for him. These spiders generally eat live crickets, but you can also feed other insects, such as moths, beetle larvae, grasshoppers and katydids. Although your pet gets most of his water from his food, you'll also need to provide him with a shallow dish of water in his tank. This will also help to keep his enclosure humid. What Kind of Habitats Do Rose Hair Tarantulas Like?